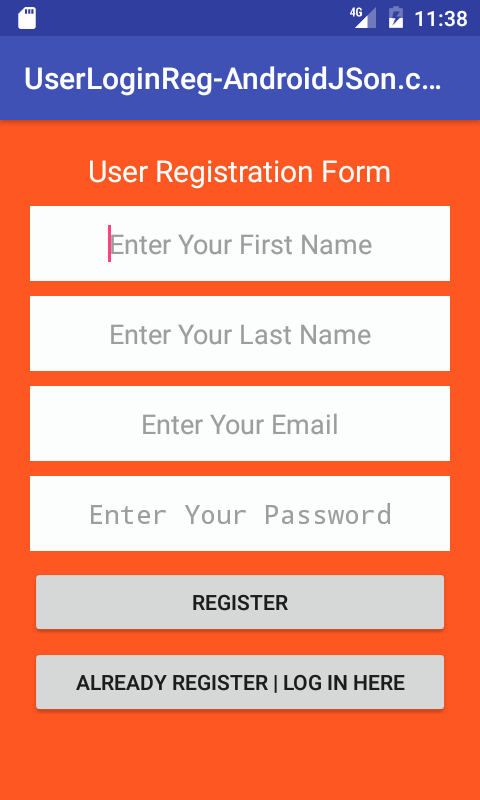 How to create android user registration app including same email exists condition with User Login and insert User Name, Email, Password on dynamic online server in android studio tutorial with all the source code. 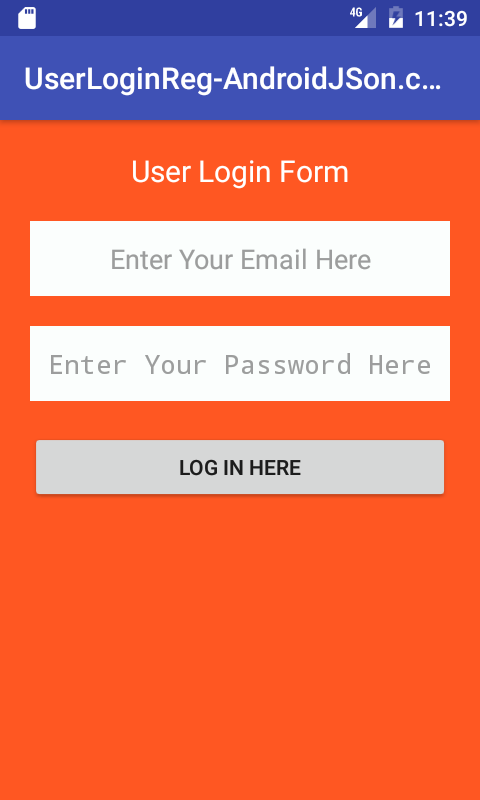 Project Description : In this tutorial we would going to create an android application with three different activities performs the task of User Registration where application user insert their First Name, Last Name, Email and Password. All that details would store – insert directly into MySQL database present on online hosting server. The technology to insert All the data on server including receiving and inserting data is performed using PHP language. After register user would goto login screen where he put its Email and Password to login into application. After successfully login user would redirect to the User Profile Dashboard screen. So here is the complete step by step tutorial for Android Server Login And Registration With PHP MySQL. User Registration Form Including same email exist condition so duplicate email user would not register again. Create database including table on your hosting server. Create PHP script to receive and insert registration and login details into MySQL database. Start a new android application project. Next step is to create a database on your online server and inside that database create a fresh table which will used to insert User registration details like i did in below screenshot. 4. Start a new android application project . Open your Project’s AndroidManifest.xml file and add below internet permission. //Adding Click Listener on button. android:text="Already Register | Log In Here"
Code for activity_user_login.xml layout file. 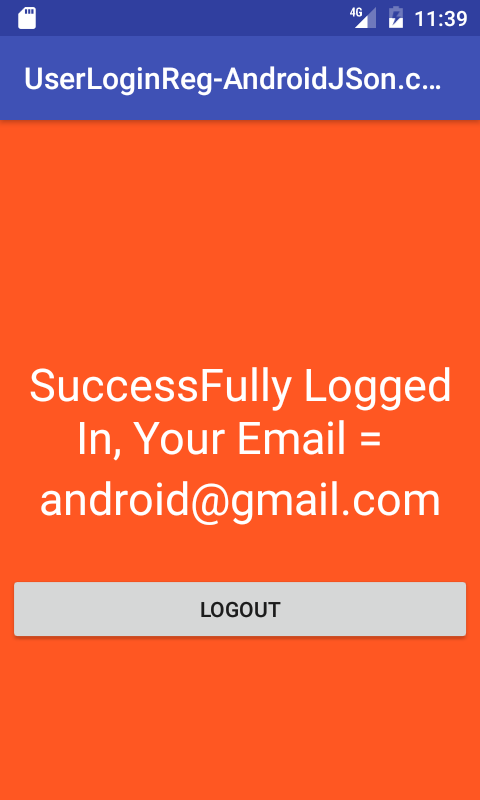 android:text="SuccessFully Logged In, Your Email =  "
Tajveez read my this tutorial https://androidjson.com/android-php-insert-display-select-update-delete/ using this you can get data from PHP to android after login by making a query with email or ID . I have a problem, I filled out the error-free project in android studio by modifying the links you got php, i loaded the php file into my host space by entering the data in my database. When i go to run the apk by re-writing, I get a script in the app after loading data like this: . Marco please explain your question more briefly ? Thanks Admin, I wrote to you. Marco check you mail box, i have solved your issue. Yes Paddy tell me what error is coming ? is the email above your correct email admin? Also.. i keep getting email already exists?